Just because you have diabetes and have to watch your blood sugar closely, that doesn’t mean all you can eat are low-glycemic fruits. 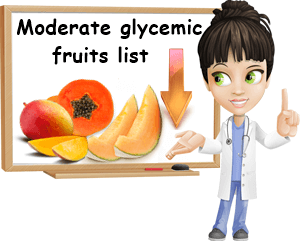 Whilst low GI – glycemic index and GL – glycemic load fruits are the safest choice for blood sugar control, sometimes you crave bananas or mango or cantaloupe or pineapple and these options are not low glycemic. Plenty of commonly available fruits are moderate GI and not the absolute best choice for diabetics or anyone needing to keep their blood sugar in check. But how much of a fruit you eat and how often you eat it can really make a difference when it comes to its effects on blood sugar. For example, plenty of moderate glycemic index fruits can be consumed safely with diabetes so long as intakes are reasonable. Keeping to small portions can limit the number of carbohydrates you get from a serving of a fruit and contribute to lesser effects on blood sugar. In other words, a moderate glycemic index, GI, fruit can be low glycemic load, GL, if you eat less of it. The glycemic index (GI) estimates how fast the carbohydrates in a food raise blood sugar levels. Below 55 is a low GI. Between 56-69 is a moderate GI. Between 70-100 is a high GI. The glycemic load (GL) estimates how fast the carbohydrates in a serving of a food raise blood sugar levels. Between 0-10 is a low GL. Between 11-19 is a moderate GL. Over 20 is a high GL. Not fully ripe bananas can have a glycemic index as low as 42-51 (when eaten raw, which is not exactly recommended – see Are Unripe Bananas Bad for You?). Ripe bananas are a moderate GI fruit with an average glycemic index score of 62. This is because the nutritional makeup of a fruit changes when it’s ripe compared to when it’s unripe. The riper a fruit is, the more the complex carbohydrates in it start to break down and become more readily digestible. For example, as a fruit ripens it become sweeter as it accumulates more sugars. A banana is considered ripe if it’s yellow all over or has brown or black spots or blotches. If it has green on it, even if only on the stem, then it’s not yet fully ripe and may have a lower GI score (how low exactly is something you can only tell if you test the fruit itself). A firmer pulp is also an indication of a less ripe fruit, while a soft pulp that doesn’t really require chewing is indication of complete ripeness. The GL for 100 g of ripe banana is 14 (moderate), considering 100 g of the ripe fruit provides 22.82 g of carbohydrates. The GL scores for one small, medium, large and extra-large fruit are 14.3, 16.7, 19.2 and 21.5, so moderate to high. Mango is often listed as a low GI fruit because it has been found to have a glycemic index as low as 55 in some cases. However, GI values are not consistent even for the same fruit variety. Growing conditions, soil quality, degree of ripeness, variety, sugar composition of individual fruits and more can influence a fruit’s GI score. The glycemic index for mangoes is not always 55, but rather borders both low and moderate glycemic indexes. Depending on the fruit considered, its degree of ripeness, individual nutritional composition etc., the glycemic index for mango can easily go a lot higher than 55, making it more of a moderate GI fruit rather than a low one. Assuming a GI of 55-56 (lowest known values that are not necessarily applicable to all mangoes), the glycemic load for a serving of 100 g is 8 (low score). But the glycemic load for a cup of mango pieces (estimated weight of cup: 165 g) is 14 (moderate score). Papaya makes the list for moderate GI foods, with a glycemic index score of 59. A serving of 100 g of papaya provides 10.82 g of carbohydrates and has a glycemic load of 6 (low score). One cup of 1-inch papaya pieces (estimated weight of cup: 145 g) provides 15.69 g of carbohydrates and has a glycemic load of 9 (low score). To be noted: There are sources that put papaya in the low GI list of fruits, with a GI score of 34.80 (±12.78). Source: Glycemic Index values of some Jaffna fruits, published in Functional Foods in Health and Disease, 2012, 2(2):25-34. Readily available and loved by diabetics and non-diabetics alike, pineapple holds the potential to raise blood sugar levels. The average glycemic index of fresh pineapple is 66 (moderate), although there are those that consider a less ripe, less sweet variety of the fresh fruit may go lower than 55. What this means is that the fruit can produce significant enough effects on blood sugar that it may affect diabetics in particular. A serving of 100 g the fresh fruit provides an average of 13.12 g of carbohydrates, whilst a cup of pineapple chunks (estimated weight of cup: 165 g) provides 21.65 g of carbohydrates. This makes the glycemic load of a serving of 100 g of fresh pineapple about 8.65, estimated at 9 (low GL score), while the glycemic load of a serving of one cup of the fresh fruit about 14.2, estimated at 14 (moderate GL score). For diabetics, a smaller serving of 50 g of the fresh fruit with a glycemic load of 4.32, estimated at 4 (low GL score) is much more appropriate for avoiding spikes in blood sugar levels. A serving of 100 g of cantaloupe gets you about 8.16 g of carbohydrates, making the glycemic load 5.3, estimated at 5 (low score). A serving of a cup of cantaloupe balls with an estimated weight of 177 g gets you around 14.44 g of carbohydrates, which makes the glycemic load 9.38, estimated at 9 (low score). It’s clear that, despite being a moderate GI fruit, cantaloupe can be consumed even by diabetics because it has a low GL value. Of course, intake is best kept moderate and according to each diabetic’s individual nutritional requirements. Studies show jackfruit glycemic index to be 65.36 ±8.00 (Source: Glycemic Index values of some Jaffna fruits, published in Functional Foods in Health and Disease, 2012, 2(2):25-34), making it a moderate GI fruit. 100 g of jackfruit provides 23.25 g of carbohydrates of which 19.08 g are sugars and 1.5 g dietary fiber. Assuming a GI score of 65, the glycemic load of a serving of 100 g of jackfruit is 15 (moderate GL). A cup of jackfruit slices (estimated weight of cup: 165 g) provides 38.36 g of carbohydrates of which 31.48 g are sugars and 2.5 g dietary fiber. Assuming a GI score of 65, a cup of jackfruit slices at 165 g has glycemic load of 24.9, estimated at 25 (high GL). Breadfruit has a glycemic index of 65-68, moderate but bordering on high and provides 27.12 g of carbohydrates per 100 g and 59.66 g of carbohydrates per cup (estimated weight of cup: 220 g). The glycemic load for a serving of 100 g of breadfruit is 17.6 – 18.4, estimated at 18 (moderate score, bordering on high). The glycemic load for a serving of one breadfruit cup is 38.77 – 40.5, estimated at 39-40 (very high score). Despite being a moderate GI food, breadfruit is best consumed in fairly small portions if you’re diabetic or looking to control your blood sugar. Fresh lychee or litchi fruit range from low glycemic to moderate glycemic, with a GI score of 50-60. There is a study that shows lychee/litchi have a GI score of 47.9 ± 6.8 (in healthy subjects) and a GI score of 60.0 ± 8.0 (type 2 diabetics). Source: Glycemia and peak incremental indices of six popular fruits in Taiwan: healthy and Type 2 diabetes subjects compared, published in J Clin Biochem Nutr. 2011 Nov; 49(3): 195–199. A serving of 100 g of litchis provides 16.53 g of carbohydrates, a cup of the fruit (estimated weight: 190 g) provides 31.41 g of carbohydrates while 1 litchi (estimated weight: 9.6 g) provides 1.59 g of carbohydrates. Given a GI of 60 (for type 2 diabetics), the glycemic load for a serving of 100 of litchi is 9.9, estimated at 10 (low GL score, bordering on moderate). The glycemic load for a cup of the fruit is 18.8, estimated at 19 (moderate GL, bordering on high). Whereas a serving of 5 litchis has a glycemic load of 4.77, estimated at 5 (low score). As a diabetic, your diet isn’t restricted to low-glycemic fruits all the time (see the 10 Lowest Glycemic Fruits). You also have a selection of moderate-glycemic options to choose from and add to your nutrition. The only condition for eating fruits such as cantaloupe, pineapple, litchi, mango or bananas is to have small servings at once. Eating smaller servings ensures you get a limited amount of carbohydrates and helps you achieve blood sugar control, even when your choice of fruit is not the lowest glycemic.